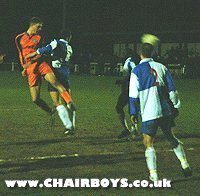 A very youthful Wanderers side slumped to a 3-0 defeat at Burnham in this Berks and Bucks Senior Cup replay. Wanderers made six changes to the side that had drew 3-3 at Adams Park two weeks previous while Burnham made just the one change with Ruben Howell coming in for their goalscoring hero from the first game, Craig O'Connor. Wanderers inexperienced side could have taken the lead early on when Jonny Dixon's cross from the right was squeezed away by the home defence but on eight minutes Burnham took the lead, Matty Potter smashing the ball home at the far post after the ball had been fed in from the right flank. Stewart Castledine screwed an effort wide for Wycombe on 27 minutes but Burnham doubled their lead on 36 minutes when a corner came in from the left and Micky Durkin turned to shoot home from just inside the six yard box. Youth Team triallist Luke Sheekey went close for Wycombe on 38 minutes when his 20 yard effort was spectacularly tipped over by Danny Honey in the Burnham goal. However, three minutes before the break the tie was effectively over when Potter crossed from the left and Micky Durkin headed home from six yards with the Wycombe defence left wanting again. Tall centre-back Luke Oliver directed a header just wide of the far post from a Wycombe corner from the right midway through the second-half but Wanderers rarely threatened and the home side were good value for their win. Burnham now go to Chesham United in the semi-final with the winners going on to the final at Adams Park.